I fell in love with Hobart the minute I stepped foot in the Tasmanian capital. 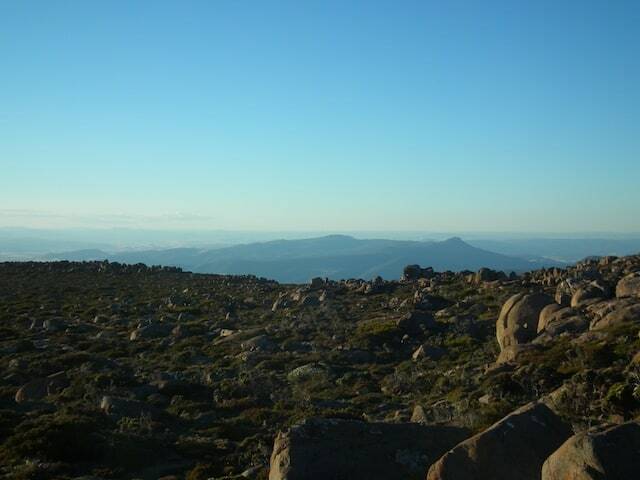 It was in June 2010, and I was about to embark on a 7-day organized tour across Tasmania. June means winter in Australia, but being Canadian, I found the weather to be just perfect for the season (approximately 50F, or 10C). I had only planned to spend a day in the city, and fly back to Sydney as soon as my tour was over. But, being a super-organized traveler, I hadn’t yet bought a ticket back to the mainland, which ended up being a blessing (fun fact: there are only two ways to get to Tasmania, the Melbourne-Devonport ferry, or by plane). I decided to extend my stay, and spend a few days aimlessly wandering about the city. Much smaller than other Australian State capitals, many find it to be void of touristic infrastructure. While it’s true that there aren’t many attractions to visit, those that exist are absolutely worth the detour. You go to Hobart to relax, to eat in local restaurants, to drink craft cider in the company of friends, to see live music. You go to Hobart to live Hobart. Opened in 2011, MONA has quickly become one of the world’s most talked about museums. Entirely privately funded, it is free to visit for Tasmanian residents, but there is an entrance fee for out-of-state visitors. The visit to MONA starts with a ferry ride on the Derwent river. An army print ferry with sheep seats and other weird details exists, but was unfortunately under repairs when I visited. As the boat approaches the museum, you start to understand just how different this experience will be: the vast majority of the museum is built underground, into a cliff. A minute inside confirms this feeling: the ambiance is dark, and there are no descriptions next to the artwork. Instead, you are given an O (an iPod) that can geo-locate you in the museum and provide insight into whatever it is you are looking at. Hobart’s most famous landmark is worth one, two, or five visits. While many tour companies offer to drive you to the summit and back to the city, the mountain is best experienced by walking down its many trails. For the semi-lazy like myself, some companies offer to drive you to the summit, but leave you to find your own way back. You can therefore enjoy the spectacular views at your own pace, and walk one of the many trails down to Fern Tree, a town with a bizarre bus stop from which you can take a city bus back to Hobart. 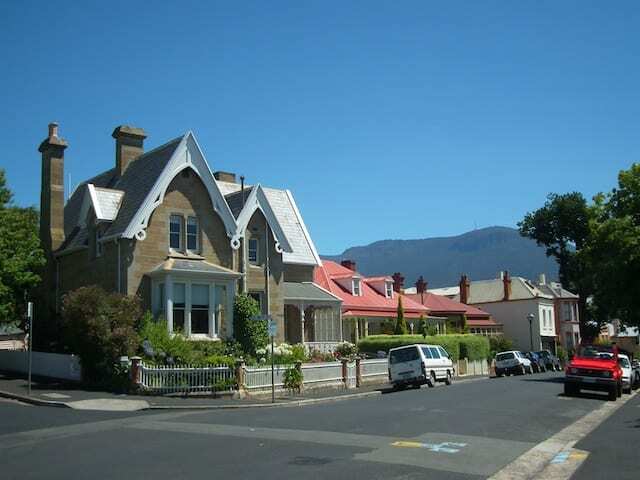 Salamanca is an historic neighborhood in the center of Hobart. Built by the river, it is a small area of old sandstone buildings, which have mostly been converted into restaurants and bars. Some of my favorites include Jack Greene, a bar where you can often catch a live set by a local musician; Machine Laundry Café for a decadent breakfast in an actual launderette; and Tricycle for the perfect brunch and coffee. Also not to miss is Salamanca’s famous Saturday market. You’ll find souvenirs, jewelry, and snacks, but also fresh fruit and vegetables, flowers, and cheese (Tasmanian cheese is delicious). Salamanca’s sandstone buildings also feature many galleries and shops where you can find locally made souvenirs. Battery Point is another historic Hobart neighborhood, situated just up the stairs (the Kelly Steps) from Salamanca. Here you will find charming little cottages, beautiful cul-de-sacs and stunning views towards Mt. Wellington. 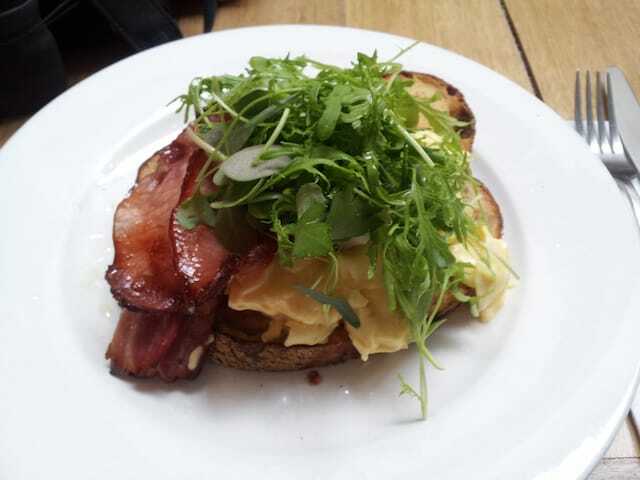 Take a break at the Jam Jar Lounge, my favorite café in the city. If you haven’t tried Australia’s famous Sunday sessions, which are the perfect excuse to drink in the daytime, this is the place to do it. Gorgeous décor and occasional live jazz bands make for a great ambiance. The café also serves dinner on Friday nights (reservations mandatory). You do not have to be a beer enthusiast to enjoy a visit to the Cascade Brewery. Located just outside of the city, the brewery is simply beautiful and full of history. I took the tour out of touristic duty (that’s a thing) since I’m not a big fan of beer, but ended up loving hearing about the incredible history of the building and the people who created it. A sampling of beers (or ciders) is included in the price of admission, and the grounds feature stunning gardens (best experienced when it’s not pouring outside). It is possible to walk here from the city center, though the walking trail isn’t as spectacular as some others that can be found in Australia. For those wishing to make a day out of a visit to Mt. 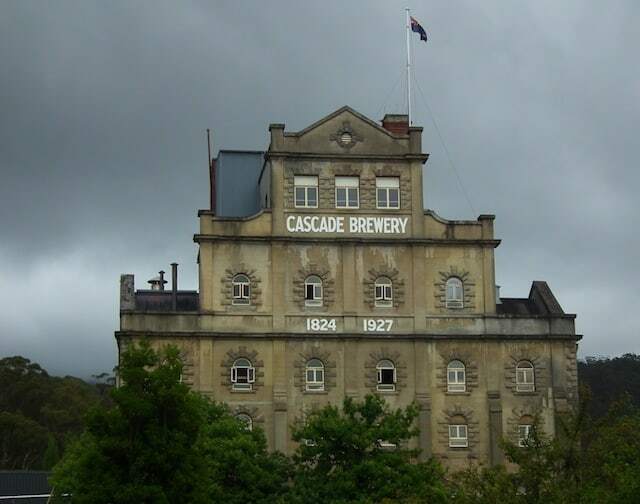 Wellington and the Cascade Brewery, the trail extends along 12.7 kilometers from the top of the mountain to the waterfront. Beatrice Bernard-Poulin is a freelance writer and PR specialist from Montreal, Canada. She blogs in both French in English at Eille la cheap! 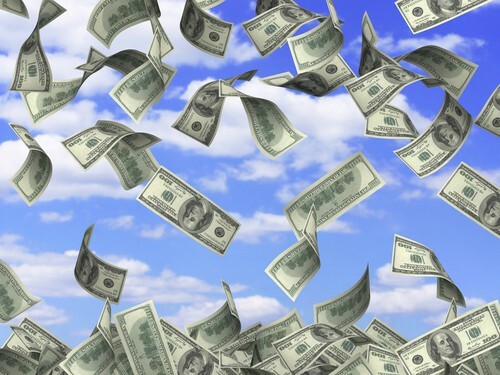 about living the life of your dreams on a realistic (often small) budget. She’s also obsessed with Hobart. I am reading so much about Tasmania lately and as an Aussie I am embarrassed to say that I never really thought of going there. But after reading so much about it lately I think I will be heading there soon. 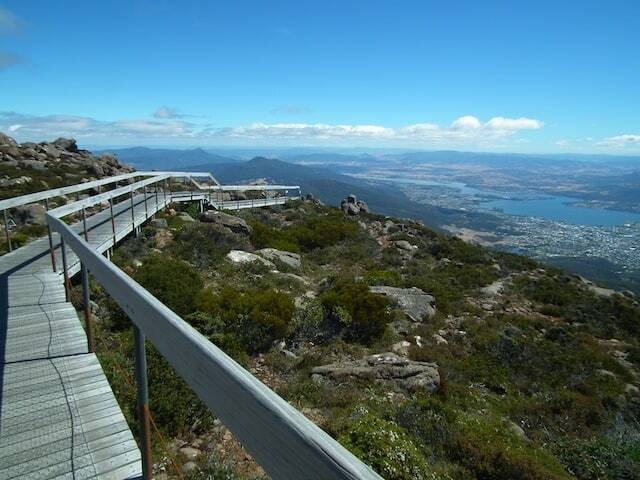 That view from Mt Wellington is pretty awesome! it’s not just Aussies that aren’t immediately drawn towards Tasmania… It doesn’t seem like an obvious destination when it should totally be one. I actually would never have gone if it wasn’t for my cousin insisting that it was worth the detour. Now I recommend it to everyone! I’m a big urban enthusiast … for me, the city itself is the attraction … having said that, great view from atop Mount Wellington! It looks beautiful. I hope I get the chance to visit Tasmania while I’m still in Australia. Thanks! And you do need to visit Tassie!